OnePlus 7 rumours are flooding the internet almost every alternate day. Now render of the OnePlus 7 has been leaked online which yet again hints at pop-up selfie camera and triple rear camera setup on the back. The case render of the OnePlus 7 goes in line with the past leaked renders and leaks. The render gives out a fair idea about the OnePlus 7 design. Yet again, the case render suggests that the OnePlus’ next flagship phone aka the OnePlus 7 will come packed with a pop-up selfie camera setup on the front panel similar to the Vivo Nex, Oppo F11 Pro, and the new V15 series. In addition, it also suggests that the OnePlus 7 will come with triple cameras on the back panel which will be paired with LED flash. Overall, the case render suggests that the OnePlus 7 will be a much-upgraded version of the OnePlus 6T which was launched in the second half of 2018. OnePlus 7 Case Render Leaked: What to Expect? The case render of the OnePlus 7 has been leaked by the popular tipster SlashLeaks, who provides accurate information for the most part. The case leak of the OnePlus 7 shows a cut out at the top of the phone which hints at the pop-up selfie camera setup on the front. It is suggested that the OnePlus 7 may come with the same camera set up on the front as the Vivo V15 Pro. This means we can expect the OnePlus 7 to come with 32MP selfie shooter on the front. The case render shows the volume rockers on the right side of the phone while surprisingly the power key is spotted on the left side of the phone. Well, the power button on the left? Not very sure about that though. At the bottom, the render shows two cutouts which will mostly be for the speaker grills and USB Type C. Where’s the headphone jack? Rumours suggest that the OnePlus 7 will not come with headphone jack similar to the OnePlus 6T. Also, there’s a reason why OnePlus 7 will ditch the 3.5mm headphone jack. To recall, OnePlus CEO Pete Lau in an interview recently had said that the removal of the headphone jack speeds up the development of true wireless earphone. Yes, there are high chances that alongside the OnePlus 7 the computer may launch true wireless earphones. The company is yet to talk about the earphones though. 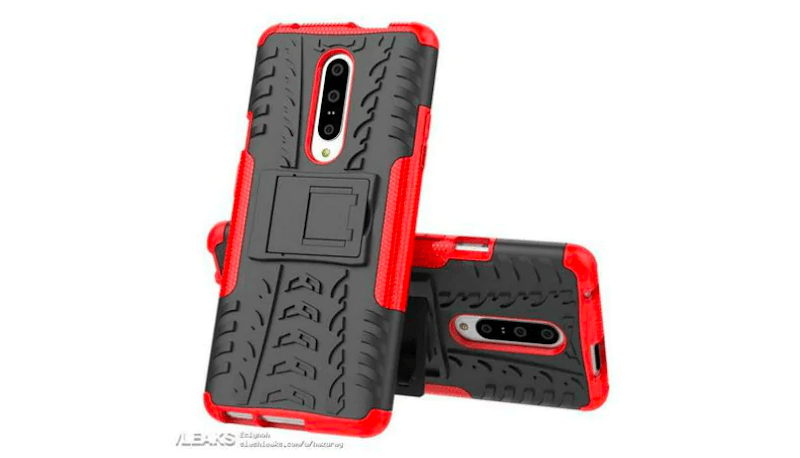 Coming back to the case render, it suggests that the OnePlus 7 will include the triple rear cameras in a horizontal fashion on the top centre of the back panel. Below the camera setup, the phone is said to include a flash, the render reveals. What Do We Know About the OnePlus 7? So far, we have heard a lot about OnePlus 7. The smartphone is expected to launch soon possibly by May or so. The OnePlus 7 is tipped to come with Snapdragon 855 chipset and use X50 modem. Rumours suggest that the phone may include a 6.5-inch screen with AMOLED panel on top. The OnePlus 7 is also expected to come with an in-display fingerprint sensor which will be much faster than the one present on the OnePlus 6T.